Greetings bodybuilders, athletes, and those entering the game; the following discussion can benefit every man inside and outside of the gym, whether you’re a weight lifter or endurance runner. The topic is testosterone, and we’re going to cover it the right way. Every technique and simple lifestyle adjustment that we mention here is based off of peer reviewed scientific research papers. In addition, we are not trying to sell you anything except for useful, applicable knowledge for the price of 5 minutes reading time. If your looking for Test Boosting Supplements, check out our articles under testosterone boosters. Normally we would not write an article on such a ‘saturated’ topic like increasing testosterone without supplementation. That’s because it’s so difficult to get your message out with so many other articles competing. But, we had to do this. Why? Because 90% of the articles out there are complete bogus. With that being said, even if only five of our readers are able to check out this article; we’ve done a good deed by supplying real information that can make an actual impact on your training. Here we go. As a male, everything affects our testosterone levels. This ranges from something as small as seeing an attractive woman, to something as large as aggressively working out. Here, we are going to focus on the variables that offer you the largest boost in free testosterone. Below we cover the top 3 easiest and most effective natural test boosting practices. No matter if you lift weights or not, the most effective way to raise your free testosterone levels is to increase the duration and quality of your sleep schedule. This change is simple, and built into our genetics. The best way to describe the relationship between sleep and testosterone is this: by getting less than 7 hours of sleep each night, you are robbing yourself of testosterone. It’s that simple. If you have trouble coming to terms with this, let us reiterate. Your body is designed to get 7+ hours of sleep each night. If you are not meeting that need, you are failing, you are in the red, and you are settling for less. 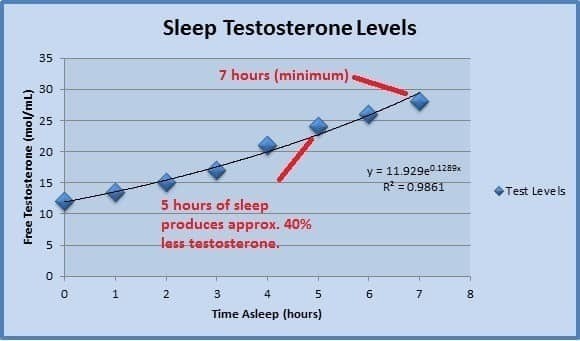 The majority of free testosterone in the body is produced while the body sleeps. The production of testosterone rises semi-logarithmically from the start of sleep and peaks at the moment of waking (Axelsson, 2013). As you can see in the figure, one extra hour of sleep can make an incredible difference on a semi-logarithmic curve. Looking further, after you wake; testosterone levels decrease rapidly every hour you stay awake. Therefore, by staying awake for long periods of time in addition to sleeping for short periods of time; you are producing a ‘double-whammy’ reduction in testosterone levels. The types of exercises you do in the gym go beyond muscle targeting and include exercise-induced testosterone production. Depending on your workout choices, you can either be promoting raised testosterone levels and associated muscle growth; or you can be inhibiting testosterone production resulting in the latter. It all boils down to exercise intensity. Long term low intensity exercise such as endurance running results in reduced free testosterone (Wheeler, 1984). Alternatively, high intensity compound exercises such as the squat, deadlift, and bench-press produce free testosterone surges (Schwab, 1993). Next time you’re in the gym, exercising on a machine or doing a highly isolated motion; take a moment to evaluate the intensity of what you are actually doing. The best way to evaluate intensity is the ‘face-test’. That being- if you’re not making a straining face, then you are not performing a high intensity exercise; either defined by weight or motion (Admin, 2014). Everything you consume influences your testosterone levels, some foods more than others. This happens through many complex and often interconnected pathways that we will not discuss in detail. Instead, we will link cause to effect so you can learn a few solid testosterone promoting nutrients as quickly as possible. More so, the following nutrients are effective in addition to a reasonable diet selected based on your goals. The following specific vitamins and minerals boost testosterone levels in men even without high intensity training. However, men that train have a greater rise in free testosterone versus those whom do not. Magnesium – Over 300 biochemical pathways in the human body require magnesium to function (Barbagallo, 2010). For athletes, the presence of adequate magnesium in muscle tissue increases energy output per oxygen intake (Lukaski, 2004). Likewise, athletes with reduced magnesium levels require more oxygen to produce the same energy. Regarding testosterone, healthy magnesium concentrations actively reduce non-competitive inhibition of bioavailable testosterone (Excoffon, 2009). This molecular interaction occurs with the addition of calcium and zinc which when paired with magnesium bind to the protein SHBG. So, the take home message – adequate magnesium, zinc, and calcium intake (not necessarily in the same meal) is found to support testosterone production in men, even if they are not training. 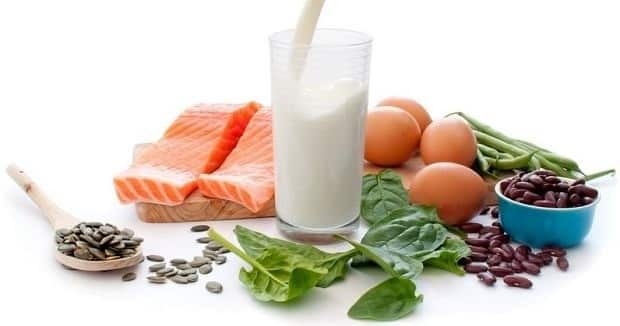 Vitamin D3 – Similar to Magnesium, Calcium, and Zinc; adequate D3 levels support testosterone production in healthy men. This production is independent of exercise, and can be sustained theoretically indefinitely. Interestingly, the testosterone produced by adequate D3 intake is approximated to the testes, meaning; vitamin D3 promotes testosterone production and healthy testicular function. This is just a few of the factors that influence your body’s testosterone production. Many of these situations are based upon meeting biological standards. That is, by not meeting these standards you are not producing the testosterone you ought to be. There are many other ways to raise your test levels to benefit training and muscle growth, though we are confident that these are the most applicable. By getting more sleep, training smarter, and taking in adequate Magnesium, Calcium, Zinc, and D3 – you will begin to produce significantly more testosterone than previously. All with a few very simple lifestyle changes. Join the conversation! What approach do you take for boosting testosterone? Lets talk.